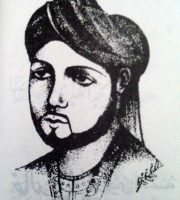 Amir Khusro was a famous sufi poet and musician. His poetry was considered to be one of the great classics of Persian poetry during later centuries. He has written in many verse forms including ghazal, masnavi, qata, rubai, do-baiti and tarkib-band. His contribution to the development of the ghazal, is significant. He was a prolific classical poet associated with the royal courts of more than seven rulers of the Delhi Sultanate. His poetry is still sung today at Sufi shrines throughout Pakistan and India.